swamp life: pre birthday awesomeness! 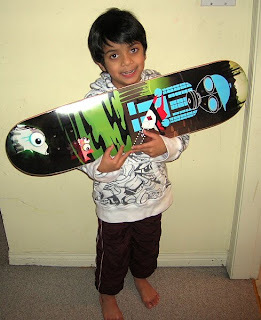 Youngblood's hyped on his new skate deck. The good people at Nixon made it extra sweet with JP Walker’s stepchild snowboards graphic on the base. Plus the deck showed up one day before the tike’s birthday, awesome!